The period between the battles of Narva (November 1700) and Poltava (June 1709) was largely one of success for Swedish arms. After crushing the Russians at Narva, Charles XII of Sweden turned his attention to Poland-Saxony, and after a series of victories over the following six years placed his preferred man, Stanislaus Leszczynski, onto the Polish throne, thus eliminating Poland and Saxony from the war. With this done it was time to do the same to Peter the Great's Russia, but in the years after Narva Peter had modernised and reformed his army, and when it met the Swedes at Poltava it inflicted its own crushing defeat which signaled the end of Swedish hegemony in the Baltic and the rise of Russia as a major power. As usual with Strelets 'big box' sets this one is partly made up of sets already released by themselves. 'From Narva to Poltava' contains the earlier Strelets sets of Reitars of Charles XII, Lieb-Drabants of Charles XII and Artillery of Charles XII - all of which have already been reviewed so will not be mentioned further here. 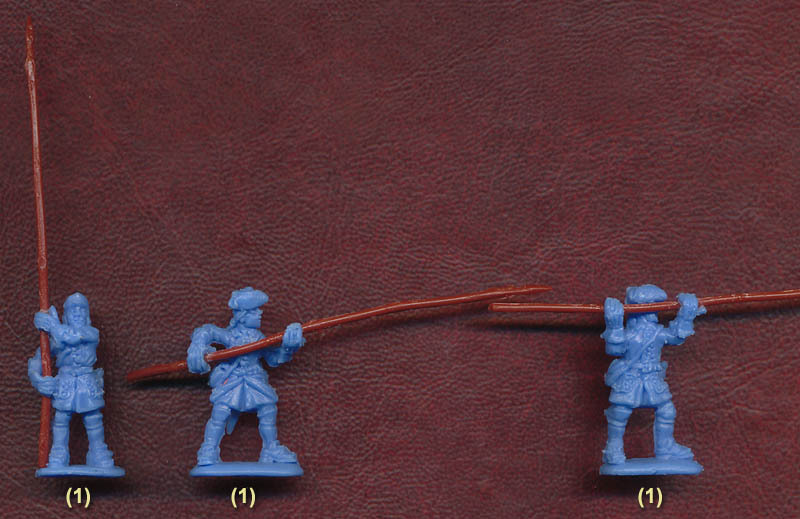 The new elements in this set are pictured above, and basically break down into pikemen, musketeers and command. The first set of Swedish Infantry from Strelets was most notable for its lack of pikemen, which was a shame as pikemen formed a significant part of Swedish armies, particularly early in this period. This set remedies that by providing 14 such poses, and pretty good ones too. All the basic pike positions are represented, and while we did not care for the man holding his sword directly over his head all the rest are useful. As can be seen the pikes themselves are supplied separately. Made in a brown plastic, they are about 60 mm (4.3 metres) in length, which is a good length for the period, and are quite nicely done with a clearly detailed head. Since they are made in the same standard soft plastic as the figures they can bend quite easily and are therefore a bit difficult to keep straight, but generally are quite good and not too thick, so could be useful for other sets too. 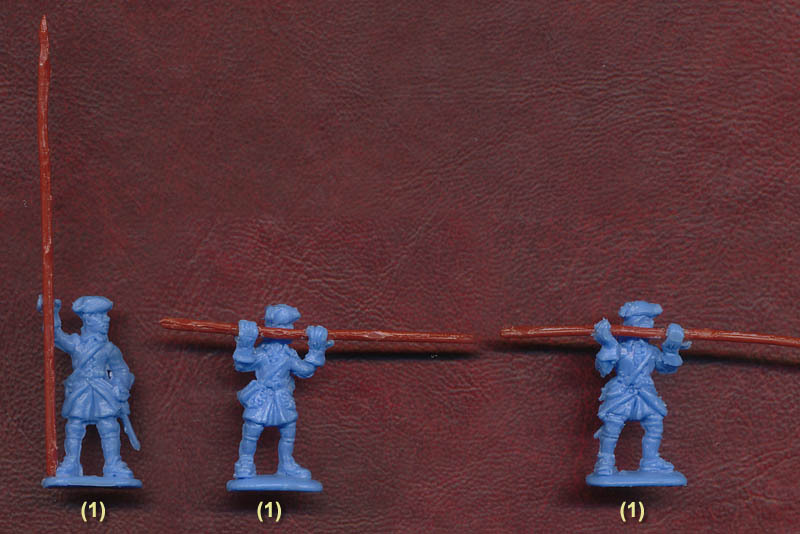 However most of the figures suffer from poor alignment of the gaps into which the pikes are meant to fit. Therefore when a pike is properly placed it tends to have to be bent around the face or body as there is not sufficient clearance to keep it straight (which is not easy to see from the angle shown above). Careful cutting away of either part of the pike or the offending body part will resolve this, but we wonder at why it seems so difficult for manufacturers to make figures that take pikes well. Some of the pikes will stay put thanks to the tight squeeze, but many require gluing, although at least most of the cupped hands are sufficiently large to accept the pike without trimming. 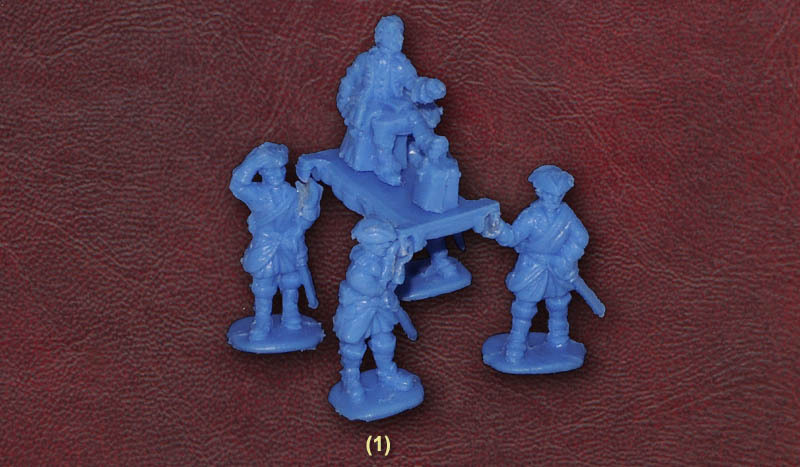 On the whole the musketeers in this set are an extension of those in the earlier set, but in many cases an important extension as several here are advancing with bayonet fixed – something that was lacking in the first set. Again the man with sword over his head is unnatural, but otherwise the poses are fine and a very necessary addition to the existing range. Officers in the Swedish army had considerable freedom in terms of dress, much as they did in all armies of the time, and generally dressed as gentlemen with the occasional military embellishment such as the cuirass. This is what we find here, and all look perfectly authentic, although strictly speaking such men would be mounted when actually in combat or on the march, so these foot figures only partly cover the subject. The flag-bearer looks OK but he carries a particularly small flag, being only about 108 scale cm high and 125 cm wide instead of the usual 177 cm high and 216 cm wide. The last figure in the same row is dressed very differently from the rest, and this is because he is not a Swede at all. He is the Cossack hetman Ivan Mazepa, who allied himself and his Ukrainian Cossacks with Charles during the Poltava campaign. However he was able to contribute little to the Swedish cause and died shortly after Poltava. The final row shows the last of the command figures. This is Charles XII himself as he might have appeared on the day of Poltava. A few days previously he had been wounded in the left foot and was therefore carried on a litter which may or may not have resembled this model (which looks rather precarious for the occupant although we could find no firm evidence of the litter's design). Apart from the small flag we found all the figures to be accurate. The mixture of coat skirts buttoned back or left loose reflects the change in practice over this period, and the mixture of the traditional Swedish Karpus cap and the familiar tricorn hat also span the intended period well. All the bayonets seem to be of the socket type rather than the older plug style, although other weaponry is difficult to identify exactly. The officers too are correctly dressed for the age, with the currently fashionable large wigs being a particular feature. The style of sculpting is in keeping with the previous set of infantry, with quite chunky detail and some flatness in places. These are typical Strelets characteristics and regular customers will find this style very familiar, although clearly they do not compare well with some other manufacturer's output. We have already mentioned the difficulties of fitting the pikes, but there is no other assembly except for the king's litter, which goes together OK. As usual there is hardly any flash and very little excess plastic too. With hindsight it is easy to see the nine years covered by this set as the high point of Swedish power, and also the start of a rapid decline as other counties (particularly Russia) managed to make their larger populations and resources tell. The new elements in this set are also a very important addition to the figures already available for this increasingly popular conflict, and while some would prefer that they were available by themselves rather than in a big box they are a significant new addition that fill many gaps in the Great Northern War Swedish range from Strelets.